Wow. Wow. Wow. That's one "Wow" for each of the Hobbit artbooks that were published so far. This artbook is still hardcover, 208 pages, and is as detailed and packed as the earlier Hobbit Chronicles books. Featured in this particular book are the environment, props, character and creature designs. It's predominantly hand drawn plus digital painting art with some 3D renders, and a few photos of miniature props. The art is fantastic. Covered, of course, are the locations as they appear in the film, such as Mirkwood, the Elven kingdom, Lake-town and the others. The designs are wonderful and really set the tone for the movies. Character art are for the new characters, such as Beorn, Evangeline Lilly's Tauriel, Legolas, the many orcs, creatures like the spiders and other miscellaneous characters of which there are a lot. Strangely, there are only a few pages of art for Smaug the dragon. You'll see quite of a lot of pencil sketched concept art from Alan Lee and John Howe, who are both concept art directors for the film. The other contributing artists are also quite amazing as to the quality of work they are putting out. It's nice to see a good mix of pencil and coloured artworks. This is mostly a showcase of the concept artworks of Weta Workshop and 3 Foot 7 Art Department. The environment and character designs are from Weta, while the sets, props and dressings are from 3 Foot 7. The writeup is also very extensive. Usually for each subject, be it character or location, there will be a few designers giving their own views and elaboration on the designs. It's very insightful as there are inputs from lots of the artists that work behind the scenes. 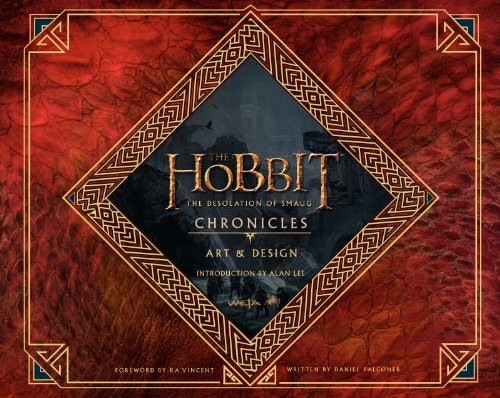 By the way, there's going to be another artbook for this film coming out later called The Hobbit: The Desolation of Smaug Chronicles: Cloaks & Daggers. Very good. This artbook is really worth the money. Highly recommended to fans of the film and concept art. There's plenty to see and read. The price of the book varies depending on who the publisher is. You can get from Harper Design if you're in USA, and Harper Collins if you're outside USA. Amazing book, but it's very expensive here, in Brazil. I'll buy on Amazon :D.